W eezer called. Said they were sorry for the disappearing act but that they’re doing fine, just fine. I want to be angry with them, but I’m just happy to have them back. Funny thing is, they haven’t changed much after all this time. A thirty-minute disc after a five-year absence? Enigmatic. 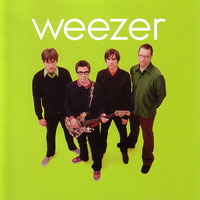 Disappointing too when you consider some of it (“Don’t Let Go,” “Knock-Down Drag-Out”) might have been jettisoned, so look at the lesser tracks as packing material for treasures like “Photograph” and “Hash Pipe.” When Weezer is “on,” as they are half of the time on The Green Album, they’re wonderful. Who else would think of a line like “Crab at the booty, t’aint gonna do no good?” What this album establishes is that the world needs Weezer. Yes, even just thirty minutes of Weezer, because they’re that sweet. They’re not simple; that’s a deception. As Teenage Fanclub showed, it’s not enough to write a handful of good pop songs. What you don’t write—noisy solos, experimental interludes, trite ballads—is just as important. Maybe that’s why The Green Album didn’t grow larger. The pleasure to be had in hearing a “Smile” slide into “Simple Pages” without some heavy metal posturing in the middle is Weezer’s pleaser. If you enjoyed their first album (and I’m pretty sure everybody on the planet did), this is a streamlined successor. It’s not as heavy, not as angry as The Blue Album. It’s not the revelation either. The joy of The Green Album is in having our prodigal son returned to us. Welcome back, Weezer.